Cancer is one of the most prominent health issues for both men and women, and rightly so - here we know that it is the number two health concern for men. It has one of the best networks for awareness and care, organizations we all are aware of that can give you any information or resource you could want on cancer. And still it seems that in the area of health men are behind women, mainly due to the pink campaign. Great for women, not so great for men. For Men's Health Week, I am going to focus on the male-specific cancer: prostate cancer. difficulty starting urination, reduced force of stream of urine, urinating small amounts frequently, urinating more frequently during the night, painful urination and bone pain. However, often there are no symptoms, so the best way to detect it is by screening with the dreaded DRE method. It may be an uncomfortable experience but then women have their own screenings for various health issues that can more than compete with this. Luckily there is also a different, more effective test. It is just more expensive. The PSA test is a blood test that can be done around the same age time period as the DRE, 50 more most men but 40 for those with family history or other risk factors. Did you know there is a blue campaign for men? Didn't think so. But there is. Where women have pink for breast cancer, blue is for prostate cancer. Perhaps the problem with the blue ribbon thing is that is is just a variation of the pink ribbon, plus blue is the most common color. 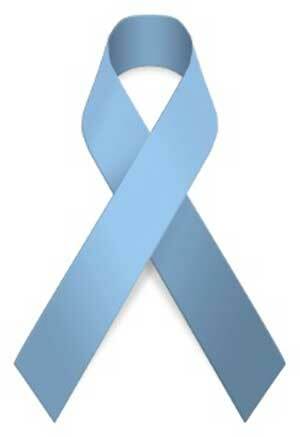 Maybe prostate cancer awareness needs a different symbol. I recommend a squirrel. If women can have 'save the boobies' type campaigns, why can't we have 'Save the nuts', with a squirrel mascot? A squirrel named Ben Dover. Personally, I have had recent experiences with cancer. Last year two female friends have been diagnosed with cancer, a male friend just passed from liver cancer in his 40s, and even lost one of my dogs to sarcoma. Perhaps I need something like a purple ribbon as when I was in Fifth grade, I had a mastectomy. Yes, a mastectomy. It was a benign tumor in my chest but in some ways I have and still do have a connection to the breast cancer movement. I always wanted a breast cancer survivor t-shirt. Get checked regularly, keep an eye out for the symptoms above, and stay Well Milwaukee.